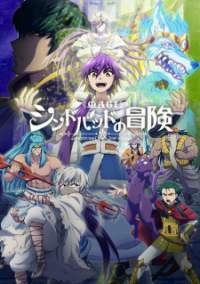 Japanese: マギ シンドバッドの冒険 Producer: Aniplex, Lay-duce Type: TV Series Status: Ongoing Genre: Action, Adventure, Fantasy, Magic, Shounen Durasi: 24 min. per ep. Episode: 8 Rating: 8.38 Added On: April 21st, 2016 Sinopsis: Menceritakan kisah awal Sinbad.